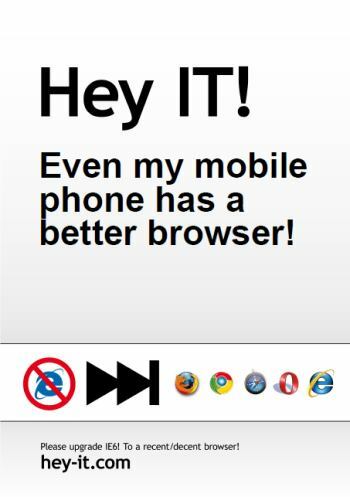 Hey IT; even my mobile phone has a better browser! I’m not entirely sure I would prefer mobile Safari on an iPhone over MSIE6 on PC, but that might have more to do with the screen size and the lack of a keyboard than anything else. This entry was posted in browsers, lang:en, mobile web and tagged hey-it, mobile browser, msie6, upgrade on 3 August 2009 by frank.